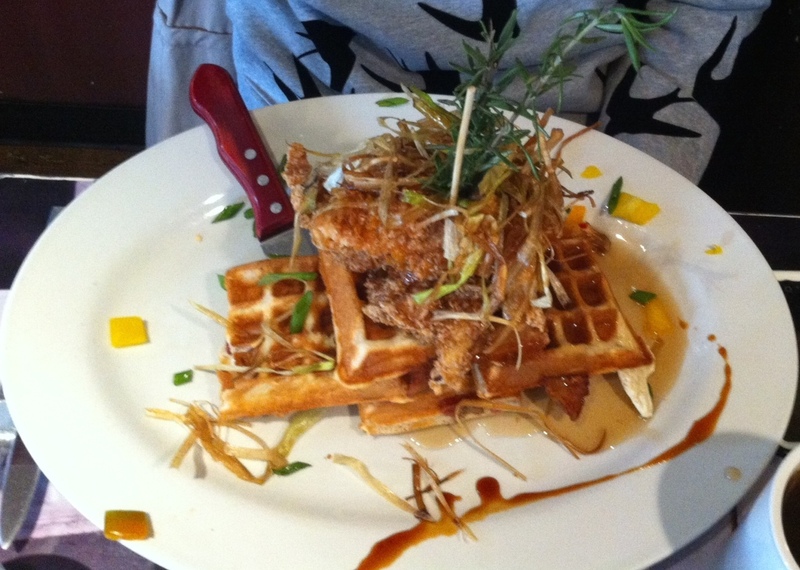 A picture of my breakfast from Hashhouse a Go Go – Andy’s Sage Fried Chicken and Bacon Waffle Tower. It’s been roughly 2 years since I’ve been to this restaurant, which has won many awards for their breakfast dishes and unique spin on classic dishes like fried chicken and waffles. Normally I gravitate to one of their Signature Pancakes like the Snickers pancake but this time I wanted to try the famous dish that they consider a classic staple on their menu. Not good for dieters but well worth the hype – chicken was moist and the outer fried shell was crunchy. Waffles were excellent with the addition of bacon bits. I highly recommend you go at least once to one of their locations – a fantastic menu and a fun experience. Posted in Media, Original Writings and tagged 2014, Breakfast, economy, fried chicken and waffles, Hashhouse, Hashhouse a Go Go, NaBloPoMo, pictures, yoursmileispriceless. Bookmark the permalink. The unique instrumentation, pacing, and haunting vibe of the song caught my attention when I saw it used for a dance routine on Dancing With the Stars this season. Posted in Media, Original Writings and tagged 2014, Come With Me Now, economy, Kongos, NaBloPoMo, yoursmileispriceless, YouTube, Youtube video. Bookmark the permalink. Who Needs Black Friday When There’s Eggs and Bacon? To my devoted readers and newcomers alike, I’d like you to meet my new dog Delilah. She is a rescue – we think she is a Great Dane/Greyhound mix. 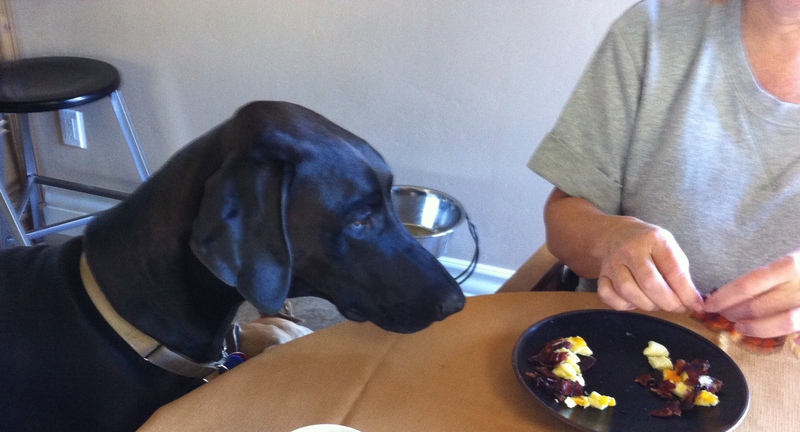 She’s still a puppy but she has quite the appetite – whenever food comes out, she’ll sit by your chair and look over her shoulder at you. Posted in Media, Original Writings and tagged 2014, a day in Gretchen's life, Delilah, dogs, economy, Great Dane, Great Dane/Greyhound mix, Greyhound, NaBloPoMo, picture, yoursmileispriceless. Bookmark the permalink. While some of my readers might be a fan of this song or can’t stand hearing this one another time, I have to admit that I enjoy listening to it as a pick-me-up whenever I’m either having a tough day or if I feel motivated to get up and dance. I remember reading an old book that suggested finding at least one positive song that you like and having that in your arsenal in times when you needed some encouragement. What about you readers? What one song makes you feel better or get up and dance? Posted in Media, Original Writings and tagged 2014, Descpicable Me 2, economy, Happy, Happy by Pharrell Williams, NaBloPoMo, Pharrell Williams, yoursmileispriceless, YouTube, Youtube video. Bookmark the permalink. Whenever I see an animated film, I like searching video sites for the B-roll, which usually shows how the actors deliver their lines behind the microphone. I think its interesting watching some of them either say their lines with various expressions or there are the ones who really get into it and move around, getting into character. Below are a few of my favorite ones from a mix of recent animated films. Do you have a favorite? Posted in Media, Original Writings and tagged 2014, b-roll, b-roll animation, b-roll films, Big Hero 6, economy, Monsters University, NaBloPoMo, The BoxTrolls, yoursmileispriceless, YouTube, Youtube video. Bookmark the permalink. Inspired by Peeta Mellark’s struggle in Suzanne Collins Mockingjay novel, I present to you my original poem. Posted in Uncategorized and tagged 2014, economy, Mockingjay, Mockingjay poem, NaBloPoMo, original poem, Peeta Mellark, Peeta Mellark poem, The Hunger Games, The Hunger Games poem, yoursmileispriceless. Bookmark the permalink. This is one of my favorite videos from Disney, which is part of their Show Your Disney Side campaign. Grumpy Cat aka Tartar Sauce shows her Disney side while hanging out with an equally grumpy figure. Posted in Media, Original Writings and tagged 2014, Disney, Disney Side, economy, Grumpy, Grumpy Cat, NaBloPoMo, Show Your Disney Side, yoursmileispriceless, YouTube, Youtube video. Bookmark the permalink.